α-Galactosylceramide (αGalCer) stimulates NKT cells and has antitumor activity in mice. Murine NKT cells may directly kill tumor cells and induce NK cell cytotoxicity, but the mechanisms are not well defined. Newly developed human CD1d/αGalCer tetrameric complexes were used to obtain highly purified human αGalCer-reactive NKT cell lines (>99%), and the mechanisms of NKT cell cytotoxicity and activation of NK cells were investigated. Human NKT cells were cytotoxic against CD1d− neuroblastoma cells only when they were rendered CD1d+ by transfection and pulsed with αGalCer. Four other CD1d− tumor cell lines of diverse origin were resistant to NKT cells, whereas Jurkat and U937 leukemia cell lines, which are constitutively CD1d+, were killed. Killing of the latter was greatly augmented in the presence of αGalCer. Upon human CD1d/αGalCer recognition, NKT cells induced potent cytotoxicity of NK cells against CD1d− neuroblastoma cell lines that were not killed directly by NKT cells. NK cell activation depended upon NKT cell production of IL-2, and was enhanced by secretion of IFN-γ. These data demonstrate that cytotoxicity of human NKT cells can be CD1d and ligand dependent, and that TCR-stimulated NKT cells produce IL-2 that is required to induce NK cell cytotoxicity. Thus, NKT cells can mediate potent antitumor activity both directly by targeting CD1d and indirectly by activating NK cells. Human NKT cells are characterized by a TCR repertoire with an invariant Vα24JαQ gene rearrangement, and they often express an NK locus-encoded C-type lectin NKR-P1A (CD161). Upon TCR stimulation, NKT cells rapidly produce a number of cytokines, including IL-4, IFN-γ, TNF-α, IL-10, IL-13, and GM-CSF (1, 2, 3, 4). Immune regulatory functions have been ascribed to NKT cells, and these include development of tolerance (5), autoimmunity, and protection from microorganisms (6). In the absence of exogenous stimulation, the role of NKT cells in antitumor responses is controversial. In one model, NKT cells were reported to protect mice from tumors induced by methylcholanthrene (7). On the contrary, another study in mice reported that CD1d-restricted CD4+ NKT cells prevented effective CTL-mediated tumor eradication in an IL-13-dependent manner (8). α-Galactosylceramide (αGalCer),3 a glycosphingolipid derived from the marine sponge Agelas mauritanius, has been demonstrated to induce potent antitumor responses in mice (9, 10, 11, 12) and to elicit cell-mediated cytotoxicity against human tumor cell lines (13, 14, 15). αGalCer, a high affinity ligand for CD1d, is presented to a major subset of human NKT cells that exclusively express Vβ11 paired with the invariant Vα24JαQ (7, 16). Mouse NKT cells have an NK-like cytolytic activity against tumor cells (17, 18), and human NKT cells have been reported to kill a variety of human tumor cell lines in a TCR-independent manner (13). However, in other reports, human NKT cells did not exhibit cytotoxicity against the same cell lines (14, 19, 20), and the very rapid activation-induced cell death that occurs in vivo in mice following αGalCer stimulation suggests that killing by NKT cells might not be the most important mechanism whereby they eradicate tumors (21, 22). Thus, the mechanism by which αGalCer-stimulated NKT cells mediate cytotoxicity is unclear. There is evidence that αGalCer-stimulated NKT cells induce NK cell proliferation and cytotoxicity (10, 19, 22, 23). This involves IFN-γ in the mouse (22, 23), but the mechanism by which human NKT cells stimulate NK cell cytotoxicity has not been defined. In this study, using human CD1d/αGalCer (hCD1d/αGalCer) tetramers, we obtained highly purified populations of human αGalCer-reactive NKT cells and evaluated the requirements for direct NKT cell cytotoxicity and for the NKT-dependent activation of NK cell cytotoxicity against tumor cell lines. We demonstrate that NKT cell cytotoxicity is CD1d restricted and ligand specific. Importantly, however, these cells can strongly activate NK cell cytotoxicity via production of IL-2 and IFN-γ. Venous peripheral blood, collected from healthy adult volunteers, was obtained after informed consent and was anticoagulated with heparin, 100 U/ml (SoloPak Laboratories, Elk Grove Village, IL). After sedimentation of erythrocytes with dextran (U.S. Biomedical, Cleveland, OH), PBMC were obtained from leukocytes by density-gradient centrifugation using Histopaque-1077 (Sigma, St. Louis, MO). NKT cells were isolated from PBMC, as described (24), with addition of FACS sorting using hCD1d/αGalCer-TriColor (TC) tetramers. Briefly, PBMC were stained with FITC-conjugated anti-Vα24 mAb C15 (Beckman-Coulter, Miami, FL) and incubated with anti-FITC MACS beads (Miltenyi Biotech, Bergisch Gladbach, Germany), according to the manufacturer’s protocol. Cells retained in the MACS column were selected as Vα24+ cells. APCs were obtained from the Vα24− fraction after depleting CD3+ cells with anti-CD3 MACS beads. Vα24+ cells and APCs (ratio 1:10) were cocultured in RPMI 1640 medium containing 10% FCS (GeminiBio-Products, Calabasas, CA), 2 mmol of l-glutamine (Irvine Scientific, Santa Ana, CA), 50 U/ml penicillin G sodium, and 50 μg/ml streptomycin sulfate (Life Technologies, Gaithersburg, MD) in the presence of 10 ng/ml αGalCer (provided by Kirin Brewery, Tokyo, Japan) with 100 U/ml rIL-2 (R&D Systems, Minneapolis, MN) for 3 wk. Subsequently, hCD1d/αGalCer tetramer-reactive NKT cells were positively sorted using a Coulter EPICS Elite flow cytometer (Beckman-Coulter). The NKT cells that were obtained were restimulated with hCD1d/αGalCer tetramer-coated plates every 2–3 wk. Multiwell six-well tissue culture plates (BD Labware, Franklin Lakes, NJ) with hCD1d/αGalCer tetramers (17 μg/well in 3 ml of PBS) were incubated overnight at 4°C and washed three times with PBS immediately before adding the cells. IL-2 (50 ng/ml) was added every other day. The cell surface phenotype was analyzed by flow cytometry (multicolor immunofluorescence) using the following mAbs: FITC anti-Vα24 C15, PE anti-Vβ11 C21 (Beckman-Coulter); CyChrome anti-CD3 UCHT1, FITC anti-CD4 RPA-T4, PE anti-CD8 HIT8a, PE anti-CD161 DX12, PE anti-CD56 B159, PE anti-CD94 HP-3D9, and PE anti-CD16 3G8 (BD PharMingen, San Diego, CA). NK cells were separated from PBMC following negative selection using a NK Cell Isolation kit (Miltenyi Biotech), according to the manufacturer’s protocol. The purity of NK cells was confirmed by immunofluorescence using anti-CD56 PE B159 and anti-CD3 CyChrome UCHT1 mAbs. The NK cell preparations contained 93–96% CD56+CD3− with no detectable CD3+ cells. The neuroblastoma LA-N-1 and T cell leukemia Jurkat J32 cell lines have been described (25, 26). The neuroblastoma cell line CHLA-20 (27) was provided by C. P. Reynolds (Children’s Hospital Los Angeles, Los Angeles, CA). Other cell lines were: melanoma M14 (provided by R. Irie, John Wayne Cancer Institute, Santa Monica, CA), small cell lung carcinoma NCI-H82, cervix adenocarcinoma HeLa, histiocytic lymphoma U937, and promyelocytic leukemia HL-60 (all obtained from American Type Culture Collection (ATCC), Manassas, VA). The cells were maintained in IMDM supplemented with 10–20% heat-inactivated FCS and l-glutamine. CD1d surface expression was determined by flow cytometry using anti-CD1d mAb 42.1 (a gift from S. Porcelli, Albert Einstein College of Medicine, Bronx, NY). PE goat anti-mouse IgG (H+L) F(ab′)2 and mouse IgG1 mAb 679.1 Mc7 (Beckman-Coulter) were used for detection and isotype control, respectively. CD1d expression also was examined in Western blots using NOR3.2 mAb (Serotec, Raleigh, NC). CD1d expression in leukemia cell lines was evaluated by RT-PCR, as described (28), with modifications in the cDNA amplification protocol, including increasing the number of cycles in the PCR from 35 to 40; increasing the denaturation temperature and time from 92°C and 30 s to 94°C and 1 min, respectively; and decreasing the extension time from 3 to 2 min. Full-length hCD1d cDNA was PCR amplified and inserted into the BamHI and SalI sites of the pHβAprneo vector, which contains the human β-actin promoter (29). The plasmid containing the hCD1d coding sequence was transfected into the neuroblastoma cell line LA-N-1 using LipofectAMINE PLUS (Life Technologies), according to the manufacturer’s instructions. The transfectants were selected in 300 ng/ml G418 for 14 days. Immunofluorescence and Western blot analyses confirmed CD1d expression. The lentiviral vector plasmids pHR′CMVGFP, pMD.G, and pCMVΔR8.91 were provided by D. Kohn (Children’s Hospital Los Angeles). Construction of these plasmids was previously described (30, 31). The hCD1d cDNA was cloned into the BamHI-SalI sites of the pHR′CMVGFP vector, replacing the green fluorescent protein cDNA. Lentiviral vector particles expressing hCD1d were generated upon transient cotransfection of human kidney 293T cells (ATCC) with the three-plasmid combination, as previously described (32). Briefly, 293T cells were transfected with 10 μg of pHR′CMVhCD1d, 10 μg of pCMVΔR8.91, and 2 μg of pMD.G upon calcium phosphate precipitation (Life Technologies). Supernatants with retroviral particles, 3 ml, were added to 70% confluent neuroblastoma cell line CHLA-20 in a 25-cm2 flask, and after 24 h, the medium was replaced. Immunofluorescence analysis was performed 48 h later. hCD1d heavy chain was PCR amplified using the 5′ primer CACGTCGACGATATGGGGTGCCTGCTGTTTCTGC and the 3′ primer CAGGGATCCCCAGTAGAGGACGATGTCCTG (SalI and BamHI sites underlined), and was cloned into the SalI and BamHI sites of the previously described mouse CD1/β2-microglobulin (β2m) expression vector pBacP10pH (gift of J. Kappler, National Jewish Center, Denver, CO), which introduced a BirA biotinylation sequence and a 6-His tag immediately following the BamHI site (21). Similarly, human β2m was PCR amplified using the 5′ primer TCCGCTCGAGCGAGATGTCTCGCTCCGTGGCC and the 3′ primer ACTCCGGAGCTTACATGTCTCGATCCCAC (XhoI and BspE1 sites underlined) and cloned under the control of the p10 promoter of the same expression construct. Baculovirus isolation, hCD1d protein expression in High Five insect cells (Invitrogen, Carlsbad, CA), hCD1d purification, and tetramer production were performed, as previously described for the mouse CD1d tetramer (21). The identity of the secreted hCD1d protein was confirmed in ELISA using anti-human β2m mAb BBM.1 (33, 34) and anti-hCD1d heavy chain mAb NOR3.2. Purified hCD1d was in native conformation, as assessed by the stability of the hCD1d/β2m heterodimer during Ni agarose purification and gel filtration purification on Superdex200 column (hCD1d/β2m heterodimer elutes at position corresponding to 50 kDa). Biotinylated hCD1d was loaded with αGalCer by an overnight incubation with 3-fold molar excess of lipid, and tetramers were made by a 1-h incubation of biotin-hCD1d/αGalCer complexes with streptavidin-TC (Caltag Laboratories, Burlingame, CA). Similarly to baculovirus-derived mCD1 tetramers, hCD1d tetramers stained human and mouse NKT cells in immunofluorescence. 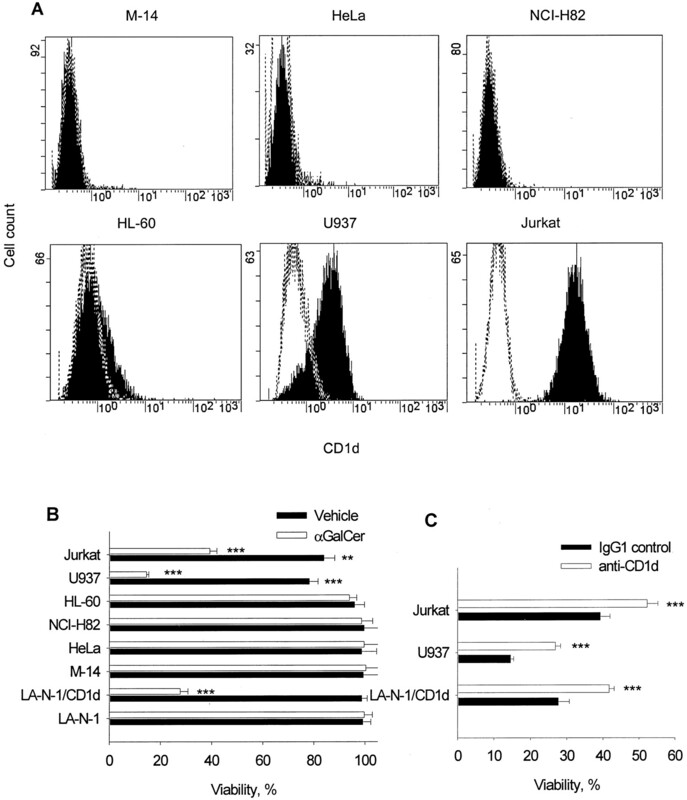 TC-hCd1d/αGalCer saturates 106 Vα24Vβ11 NKT cells when used at concentration 1 μg/ml. The tetramer was used at concentration of 2 μg/ml to detect and sort NKT cells. For NKT cell stimulation, plate-bound fluorochrome-free tetramer was used as described above. Tumor cell viability was measured by quantifying retained calcein-AM fluorescence with digital image microscopy scanning (DIMSCAN), as previously described (35, 36). Calcein-AM (Molecular Probes, Eugene, OR) was added to the target cells, 5 μg/ml, and the cells were incubated at 37°C for 30 min. After washing, labeled target cells (10,000 cells in 50 μl/well) were plated into 96-well Falcon 3072 microtiter plates (BD Labware). Effector cells were washed and added in 50 μl/well to reach the desired E:T ratio. Each plate included six wells of target cells alone as control. Plates were incubated at 37°C in a humidified atmosphere with 5% CO2 for 6 h, and then analyzed by DIMSCAN. Data were expressed as percentage of target cell viability (% viability = fluorescence intensity in the experimental well/mean fluorescence intensity in the six control wells) × 100. The mean percentage of viability ± SD for each condition was calculated from six replicate experimental wells. To study NK cell activation by NKT cells, we used Transwell six-well plates with two chambers per well separated by a 400-nm-pore membrane (Corning, Corning, NY). NKT (2 × 106 cells per chamber) and NK cells (0.5–2 × 106 cells per chamber) were cocultured in the lower and upper chambers, respectively, for 3 days without exogenous cytokines added. The lower chambers were precoated with hCD1d/αGalCer tetramers (hCD1d = 16 μg/well, αGalCer = 1 μg/well) in PBS; identical concentrations of hCD1d or αGalCer alone were used in control wells. When indicated, anti-Vα24 C15 mAb, with or without anti-CD28 37407.111 (R&D Systems), 1 μg/ml each, were used instead. Control wells were coated with the isotype control mouse IgG1 MOPC-21 mAb (BD PharMingen). Plates were incubated overnight at 4°C and then washed three times with PBS immediately before adding the cells. NKT cells were cultured in plates coated with hCD1d/αGalCer, hCD1d, or αGalCer, as described above. Culture medium, 60 μl, was collected from each well at the indicated times and frozen at −80°C until cytokine analysis. Cytokine concentrations were measured with the CBA kit (BD PharMingen), according to the manufacturer’s manual, as previously described (37, 38, 39, 40), with modification of data analysis to use GraphPad Prism software (GraphPad Software, San Diego, CA). Briefly, CBA uses a series of beads with discrete fluorescence intensity at 670 nm. Each series of beads is coated with a mAb against a single cytokine (IL-2, IL-4, IL-5, IL-10, IFN-γ, or TNF-α), and the mixture of beads detects six cytokines in one sample. A secondary PE-conjugated mAb stains the beads proportionally to the amount of bound cytokine. A cytokine standard containing a mixture of predetermined amounts of all six cytokines was used to prepare 10 serial dilutions, providing a range of concentrations from 20 to 5000 pg/ml. After fluorescence intensity calibration and electronic color compensation procedures, standard and test samples were analyzed with a Coulter EPICS Elite flow cytometer. Fluorescence was excited by the argon laser at 488 nm, and emitted light was measured at 670 and 576 nm. Data were collected using EXPO Analysis software (Beckman-Coulter). Statistics (median fluorescence intensity values at 576 nm of each bead series) was transferred to GraphPad Prism. Starting with standard dilutions, the software performed a log transformation of the data, then fit a curve to the 10 discreet points using a four-parameter logistic model. The created calibration curve for each cytokine was used to estimate the cytokine concentrations in the experimental samples. This was performed as previously described in detail (41), with minor modifications. Briefly, cells (5 × 106/ml) were incubated with the indicated stimuli (6 h, 37°C) with brefeldin A added (10 μg/ml; Sigma) for the last 3 h. To induce TCR stimulation, cells were incubated with the anti-Vα24 C15 mAb (supernatant, produced from cells provided by A. Lanzavecchia, Institute for Cancer Research, Bellinzona, Switzerland) and anti-CD28 9.3 mAb (from ATCC), washed, and plated in 6-cm petri dishes coated with a goat F(ab′)2 anti-mouse IgG (Caltag Laboratories) for cross-linking. After stimulation, the cells were fixed (3.7% formaldehyde in PBS, 10 min, room temperature), washed with PBS, and resuspended in PBS containing 0.5% saponin, 0.2% FBS, 0.005% Tween 20, 0.01% NaN3 for 18 h before intracellular cytokine detection with FITC- or PE-labeled anti-cytokine or isotype-matched IgG control mAb, as indicated. The mAb used were: FITC anti-IFN-γ B27, PE anti-TNF-α MP9-20A4, PE anti-IL-10 JES3-9D7, FITC anti-GM-CSF BVD-21C11, FITC anti-IL-2 MQ1-17H12, PE anti-IL-4 MP4-25D2, and control FITC mouse IgG1 (Caltag Laboratories); PE anti-IL-13 JES10-5A2, PE anti-IL-5 JES1-39D10, control PE rat IgG2a R35-95, and PE rat IgG1R3-34 (BD PharMingen). Control Ig was used at a concentration giving background fluorescence identical with that of the relevant Ab on control cell lines not producing the relevant cytokine. Samples were analyzed on a XL-MCL automated analytical cytometer (Beckman-Coulter). Cell-free conditioned medium was collected from NKT cells stimulated for 6 h with plate-bound tetramers or mAbs, as described above. This was distributed into vials (0.5 ml), and neutralizing mAbs, alone or combined, were added to each of 0.5-ml aliquots of the conditioned medium. The following reagents were used: anti-IL-2 mAb MQ1-17H12, anti-TNF-α mAb mAb1 (BD PharMingen), anti-IFN-γ mAb 25718.111 (R&D Systems), and goat anti-IL-2 polyclonal serum (provided by one of us). All mAbs were used at final concentration 50 μg/ml. For IL-2 depletion, two reagents were applied: mAb MQ1-17H12 and goat anti-IL-2 polyclonal serum (1:500), because the mAb alone bound only 80% IL-2, as determined by CBA analysis (data not shown) (Amersham Pharmacia Biotech, Piscataway, NJ) After 1-h incubation at 4°C, 30 μl of prewashed protein A-Sepharose suspension was added to each aliquot. After 1-h incubation at 4°C, the vials were centrifuged, and the bead-free supernatants were collected. A 50-μl aliquot from each sample was used for CBA analysis, and the remaining was used for the experiments with NK cells. To reproduce the effect of the NKT cell-conditioned medium on NK cell activation, recombinant cytokines (IL-2, IFN-γ, and TNF-α; R&D Systems) were added, alone or in combination, to the nonconditioned medium (complete RPMI 1640) or to the medium depleted of the respective cytokines. GraphPad Prism 3.0 (GraphPad Software) was used to perform Student’s t test. All p values were obtained from two-tailed tests and were considered significant when p < 0.05. Using immunomagnetic separation, ex vivo expansion, and sorting with hCD1d/αGalCer tetramers, we obtained αGalCer-reactive NKT cell lines that exclusively expressed the Vα24/Vβ11 TCR (Fig. 1⇓). Most cells were CD4+ or CD4CD8 double negative, and about half of them expressed CD161 (Table I⇓). Initially, to evaluate NKT cell cytotoxicity, we chose neuroblastoma cell lines because those that we tested do not express CD1d (Fig. 2⇓A), because they are sensitive to lymphokine-activated NK cell cytotoxicity (42, 43), and because the TN-1 neuroblastoma cell line has been reported to be sensitive to NKT cell cytotoxicity (13). The LA-N-1 and CHLA-20 cell lines were transfected with hCD1d cDNA (Fig. 2⇓A), and NKT cell cytotoxicity was tested against the parental CD1d− and CD1d+ targets (Fig. 2⇓B). NKT cells were used on days 4, 7, 10, and 14 (donor 1) and days 4, 7, and 10 (donor 2) after restimulation with hCD1d/αGalCer-coated plates. No significant difference was observed for NKT cell cytotoxicity at different times after specific restimulation (p > 0.05). In all seven experiments with NKT cell lines from two donors, only 5–27% (LA-N-1/CD1d) and 31% to 43% (CHLA-20/CD1d) of CD1d-transfected cells pulsed with αGalCer survived, but essentially 100% of the parental CD1d− and nonpulsed CD1d+ cells were viable. These data indicate that the cytotoxicity of the in vitro expanded NKT cell lines against neuroblastoma cells is CD1d restricted and ligand specific. Cell surface phenotype of hCD1d/αGalCer-reactive human NKT cells. Vα24+ lymphocytes were isolated from PBMC of healthy adult donors following separation using FITC anti-Vα24 mAb C15 and anti-FITC magnetic beads. Cells were stimulated with αGalCer (10 ng/ml) and IL-2 (100 U/ml) using autologous CD3− APC. After 3-wk culture in medium supplemented with αGalCer and IL-2 (every other day), the cells were stained with TC-hCD1d/αGalCer tetramer, and positive cells were sorted using a Coulter EPICS Elite flow cytometer. Sorted cells continued to proliferate in the presence of IL-2 (50 U/ml) alone. One week later, the phenotype of these cells was examined using TC-hCD1d/αGalCer tetramer (A) or FITC anti-Vα24 mAb C15 with PE anti-Vβ11 mAb C21 (B). Histograms are for the NKT cell population obtained from donor 1 (see Table I⇑). Identical results were obtained with three additional preparations from two independent donors. CD1d restriction and ligand dependence of the NKT cell cytotoxicity. CD1d− neuroblastoma cell lines LA-N-1 and CHLA-20 were transfected with hCD1d cDNA. A, CD1d surface expression of parental and CD1d-transfected cell lines was examined in immunofluorescence using anti-CD1d mAb 42.1 and PE anti-mouse IgG. Data are presented as overlapping histograms. Open dotted histograms, parental cells; solid filled histograms, transfected cells. B, Parental and transfected cell lines were pulsed with 100 ng/ml αGalCer or vehicle control (0.1% DMSO) overnight. After washing, the cells were loaded with calcein-AM (5 μg/ml) and cocultured at the indicated E:T ratios with purified NKT cells in 96-well plates at 37°C for 6 h. Retained calcein fluorescence was measured by DIMSCAN. Results are presented as a percentage of viable cells relative to that in target cells alone. Results are mean ± SD from one experiment representative of seven independent experiments with NKT cells from two donors performed with similar results. In the presented experiment, NKT cells were used 7 days after restimulation. To exclude the possibility that the CD1d restriction of NKT cell cytotoxicity is limited to neuroblastoma, we also tested human cell lines derived from diverse cancers and leukemias. Among these, we identified four CD1d− and two CD1d+ lines (Fig. 3⇓A). These were M-14 (melanoma), HeLa (cervical adenocarcinoma), NCI-H82 (small cell lung carcinoma), HL-60 (promyelocytic leukemia), U937 (histiocytic lymphoma), and Jurkat J32 (T cell leukemia). Strong NKT cell cytotoxicity was detected only against the CD1d+ U937 and Jurkat leukemia cell lines pulsed with αGalCer (Fig. 3⇓B). 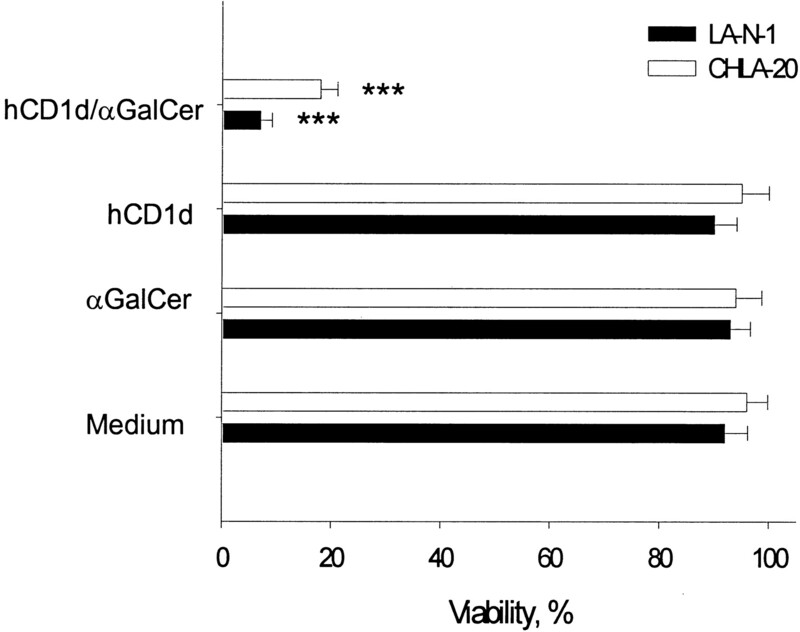 Low level cytotoxicity was observed against the same cell lines even without αGalCer pulsing (Fig. 3⇓B). In contrast, CD1d− cell lines were not killed by NKT cells, even if pulsed with αGalCer. Anti-CD1d-blocking mAb 42.1 partially inhibited NKT cell cytotoxicity against αGalCer-pulsed CD1d+ leukemia cell lines (p < 0.001) to a similar extent as αGalCer-pulsed CD1d-transfected LA-N-1 cells (Fig. 3⇓C). These data indicate CD1d restriction of human NKT cell cytotoxicity and establish that CD1d-expressing leukemia cells can be specifically recognized and killed by NKT cells, especially in the presence of αGalCer. NKT cell cytotoxicity against CD1d+ and CD1d− human tumor cell lines. A, CD1d surface expression on solid tumor and leukemia cell lines was examined using anti-CD1d mAb 42.1 and PE anti-mouse IgG. Data are expressed as overlapping histograms. Open dotted histograms, isotype control; solid filled histograms, anti-CD1d. B, NKT cell cytotoxicity against CD1d+ or CD1d− cell lines pulsed with 50 ng/ml αGalCer or vehicle control (0.05% DMSO) overnight. 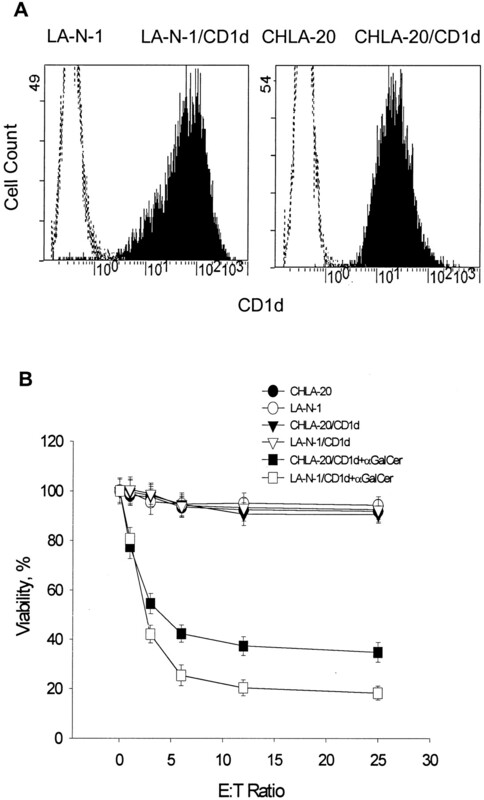 LA-N-1 and LA-N-1/CD1d were used as CD1d− and CD1d+ cell line controls. C, Cytotoxicity of NKT cells against αGalCer-pulsed CD1d+ cell lines in the presence of anti-CD1d-blocking mAb 42.1 (20 μg/ml). The E:T ratio was 10:1, and target cell viability was examined after 6 h with the DIMSCAN assay. Results are mean ± SD from one experiment representative of three independent experiments with NKT cells from two donors performed with similar results. ∗∗∗, p < 0.001; ∗∗, p < 0.01, Student’s t test. To test whether TCR-stimulated NKT cells produce soluble factors that affect NK cell cytotoxicity, we cocultured purified NKT and NK cells in a Transwell system (see Materials and Methods). After 72 h, NK cells in transwells above NKT cells that were incubated with hCD1d/αGalCer, but not with either hCD1d or αGalCer alone killed the same CD1d− neuroblastoma cell lines that were not affected by NKT cells (p < 0.001) (Fig. 4⇓). NK cell cytotoxicity was also induced in similar experiments when NKT cells were stimulated with plate-bound anti-Vα24 mAb C15 in the presence or absence of anti-CD28 mAb (data not shown). These data indicate that soluble factors produced by stimulated NKT cells induce NK cell cytotoxicity. Induction of NK cell cytotoxicity by hCD1d/αGalCer-stimulated NKT cells. NKT cells in the lower chamber of a Transwell plate along with plate-bound hCD1d/αGalCer were cocultured with NK cells in the upper chamber. hCD1d protein, αGalCer, or medium was also used in the lower chamber as control. After 72 h, NK cell cytotoxicity was tested against CD1d− neuroblastoma cell lines LA-N-1 and CHLA-20 (E:T ratio 5:1). Data are from one experiment representative of four independent experiments with NKT cells from two donors performed with similar results. To identify the cytokines produced by stimulated NKT cells, cell-free supernatants from NKT cells stimulated with hCD1d/αGalCer tetramers, hCD1d protein, or αGalCer were evaluated with the CBA assay. In addition, the proportion of cells producing cytokines was determined by multicolor immunofluorescence combining surface phenotyping and intracellular cytokine detection (Fig. 5⇓). In the first 6 h, hCD1d/αGalCer tetramers induced NKT cells to secrete significant levels of IL-2 (1.7 ng/ml), IL-4 (5.6 ng/ml), TNF-α (28.4 ng/ml), and IFN-γ (15.2 ng/ml); little IL-5 (0.3 ng/ml) and even less IL-10 (0.06 ng/ml) were secreted (Fig. 5⇓, A and C). Stimulation with rhCD1d induced very low levels of IL-4 (0.3 ng/ml), IL-5 (0.15 ng/ml), TNF-α (1.9 ng/ml), IFN-γ (1.3 ng/ml), and IL-10 (0.02 ng/ml). αGalCer alone did not induce cytokine production. Similar profiles of cytokine secretion were induced upon stimulation of NKT cells with anti-Vα24 mAb C15 with or without agonistic anti-CD28 mAb (data not shown). Intracellular accumulation of IL-2, IL-4, TNF-α, and IFN-γ was detected in NKT cells after 6-h stimulation with anti-Vα24 + anti-CD28 mAb 9.3 (Fig. 5⇓B); and TNF-α and IFN-γ were detected in distinct subpopulations (∼70%). IL-10 was not detectable, and IL-5 was either detectable at very low levels (Fig. 5⇓B) or present in a minor NKT cell subset (data not shown). Intracellular IL-13 and GM-CSF were detected by immunofluorescence in the majority of stimulated cells (data not shown). Cytokine production by TCR-stimulated NKT cells. A, NKT cells were stimulated with plate-bound hCD1d/αGalCer, hCD1d protein, or αGalCer. After 6 h, the indicated cytokines were measured in the supernatants using CBA analysis, as described in Materials and Methods. Cytokine concentration is proportional (in the range 20–5000 pg/ml) to the fluorescence intensity at 576 nm (x-axis). B, NKT cells were incubated (30 min, 4°C) with C15 (anti-Vα24) and 9.3 (anti-CD28) mAb, washed, and cultured for 6 h on goat anti-mouse IgG-coated dishes, with brefeldin A added in the last 3 h. Intracellular accumulation of the indicated cytokines was detected by direct immunofluorescence. Measurements of green (FITC) or red (PE) fluorescence (x-axis) are displayed as histograms in an overlap mode with the appropriate isotype control. Region M1 represents percentage of positive cells. C, NKT cells were stimulated with plate-bound hCD1d/αGalCer, hCD1d protein, or αGalCer. Supernatants were collected for CBA analysis after the indicated periods of time. Cytokine concentrations in the samples were calculated relative to the appropriate calibration curves created with standard dilutions for each cytokine. Data are from one experiment representative of four independent experiments with NKT cells from two donors performed with similar results. The kinetics of cytokine secretion was determined with the CBA assay. Cytokines started to accumulate in the supernatants from tetramer- or anti-Vα24 + anti-CD28-stimulated NKT cells within 2 h and reached maximum levels within 6–12 h (Fig. 5⇑C). The most abundantly produced cytokines were TNF-α, IFN-γ, and IL-4, with peak levels of 40, 20, and 8 ng/ml, respectively. High IL-2 levels, reaching 2.5 ng/ml, were produced within the first 12 h after TCR stimulation and decreased to basal levels by 30 h. IL-5 was secreted slowly, reaching a peak of 1.8 ng/ml by 36 h (data not shown), and IL-10 was the lowest, with only 0.1 ng/ml after 12-h stimulation. 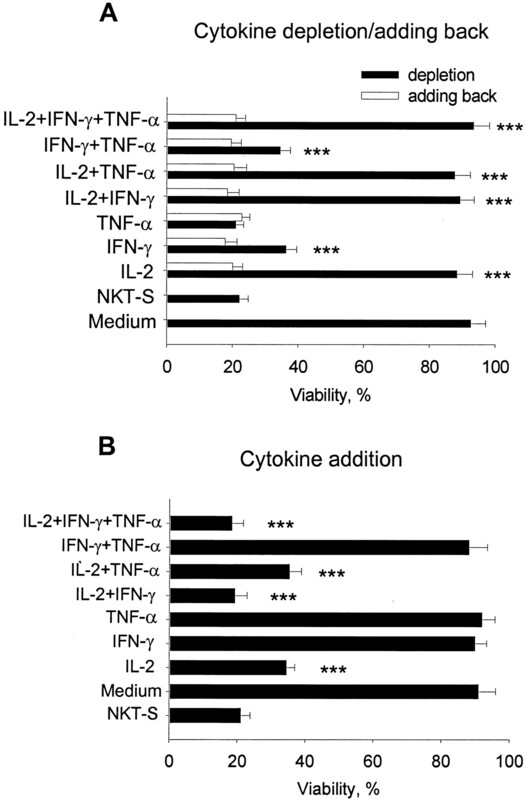 The contribution of IL-2, IFN-γ, and TNF-α to the induction of NK cell cytotoxicity was examined by depleting each cytokine from NKT cell-conditioned medium. NKT cells were incubated on hCD1d/αGalCer-coated plates, and cell-free supernatant was obtained after 6-h stimulation. Cytokines were depleted using anti-IL-2, anti-IFN-γ, and/or anti-TNF-α neutralizing mAbs and protein A-Sepharose 4 Fast Flow medium. Cytokine concentration in the supernatant was measured using the CBA assay before and after depletion (Table II⇓). NK cells were incubated for 72 h with cytokine-depleted supernatants, and their cytotoxicity was tested against LA-N-1 neuroblastoma cells (Fig. 6⇓A). Depletion of IL-2 alone was sufficient to completely abrogate NK cell cytotoxicity induced by the NKT cell supernatant (NKT-S) (p < 0.001). Depletion of IFN-γ reduced the cytotoxicity, increasing target viability from 20.1 ± 1.8 to 35.3 ± 2.3% (p < 0.001). Depletion of TNF-α, alone or combined with IFN-γ depletion, had no effect (p > 0.05). Recombinant cytokines added to the depleted supernatants in the same concentrations as originally detected (Table II⇓) completely reversed the effect of depletion, confirming the specificity of depletion (Fig. 6⇓A). Cytokine requirement for induction of NK cell cytotoxicity. A, Supernatant was collected from NKT cells stimulated with plate-bound hCD1d/αGalCer, and selected cytokines were depleted using neutralizing mAbs and Abs and protein A-Sepharose 4 Fast Flow medium. Nonconditioned medium (Medium) or cytokine-depleted NKT-S (according to Table II⇑) was added to freshly isolated NK cells. Adding back the respective recombinant cytokines was used as a specificity control. Cytotoxicity against LA-N-1 cells was tested after 72 h. B, NK cells were incubated with NKT-S, nonconditioned medium with no cytokines added (Medium), or medium supplemented with rIL-2 (1.16 ng/ml), IFN-γ (11.3 ng/ml), and/or TNF-α (17.3 ng/ml). NK cell cytotoxicity was tested against the CD1d− LA-N-1 neuroblastoma cells. The histogram shows target cell viability (mean ± SD) after 6-h coculture with NK cells (E:T ratio 5:1). Data are from one experiment representative of six independent experiments with NKT cells from two donors performed with similar results. To examine whether the effect of the NKT-S on NK cells can be reproduced by soluble cytokines, recombinant cytokines (IL-2, IFN-γ, and/or TNF-α) were added to nonconditioned tissue culture medium at the same concentrations detected in the NKT-S. Addition of IL-2 alone induced potent NK cell cytotoxicity, leaving only 35.5 ± 2% (p < 0.001) of the target cells viable (Fig. 6⇑B). NK cells incubated with IFN-γ and TNF-α, separately or combined, mediated no significant cytotoxicity (p > 0.05). However, IFN-γ (but not TNF-α) combined with IL-2 augmented NK cell cytotoxicity, decreasing target cell viability to 21.2 ± 3.3% (p < 0.001). These experiments demonstrate that IL-2 produced by TCR-stimulated NKT cells is required for induction of NK cell cytotoxicity, and in combination with IFN-γ reproduces the effect of NKT-S. This study examined the mechanisms of human NKT cell direct cytotoxicity and induction of NK cell cytotoxicity. The use of newly developed hCD1d/αGalCer tetramers allowed us to obtain purified αGalCer-reactive NKT cell lines (>99% pure) without restricting their original diversity by cloning. With these cells, we demonstrated that direct NKT cell cytotoxicity is CD1d restricted and αGalCer dependent. We also showed for the first time that TCR-stimulated human NKT cells produce IL-2, which is required and sufficient to strongly activate NK cell cytotoxicity against CD1d− target cells that are insensitive to fresh, unstimulated, NK cells. We report that human NKT cells, unable to recognize CD1d− cells, do not kill them. The neuroblastoma cell lines LA-N-1 and CHLA-20 were resistant to NKT cell lysis regardless of time after TCR stimulation, which was reported to be a crucial factor for NKT cell cytotoxicity against U937 cells (14). The restriction of NKT cell cytotoxicity by CD1d was demonstrated by converting two CD1d− neuroblastoma cell lines to CD1d+ by gene transfection and by showing that NKT cells were cytotoxic only against the CD1d+ cells. Moreover, direct NKT cell cytotoxicity requires recognition of the CD1d-bound ligand because the CD1d-transfected cells were killed only after αGalCer pulsing. CD1d restriction and specificity of human NKT cell cytotoxicity were confirmed by testing six other tumor cell lines of diverse tissue origin, four and two of which were CD1d− and CD1d+, respectively. NKT cells were highly cytotoxic only against αGalCer-pulsed cell lines that constitutively expressed CD1d on the cell surface, and the cytotoxicity was specifically inhibited by an anti-CD1d-blocking mAb. Of note, however, NKT cells mediated low-level cytotoxicity against the CD1d+ U937 and Jurkat cell lines even when the targets were not pulsed with αGalCer. This supports the hypothesis that the TCR of NKT cells can interact with CD1d loaded with endogenous lipid ligands (16, 44, 45). In agreement with this, we have observed that NKT cells produce low amounts of certain cytokines in response to plates coated with insect cell-derived rhCD1d protein, which may present bound ligand derived from insect cells. We cannot exclude the possibility that NKT cells recognize empty CD1d directly. However, given a lack of precedent for this possibility, we favor the endogenous lipid ligand hypothesis. We did not investigate the effector phase of NKT cell cytotoxicity in this study, which has been described previously as mostly perforin dependent (2, 14, 15). The observed rapid production of TNF-α (and, possibly, other TNF family proteins) by NKT cells upon αGalCer recognition suggests that direct killing that follows specific target recognition may depend, in part, on the effect of these proteins, especially against TNF-α-, FAS ligand-, and TNF-related apoptosis-inducing ligand-sensitive cells such as U937 and Jurkat. This is supported by the high level of FAS ligand mRNA expression in human NKT clones (46). Also, TNF-related apoptosis-inducing ligand has recently been found to play a crucial role in the killing of freshly isolated acute myelomonocytic leukemia cells by αGalCer-stimulated NKT cells (47). αGalCer-activated human NKT cells have been reported to exert nonspecific cytolytic activity against a wide variety of human tumor cell lines (13). Only 88% of the lymphocyte population in that in vitro study expressed Vα24/Vβ11, raising the possibility that the broad cytotoxicity may have been due to contaminating cells. Indeed, NKT cell cytotoxicity against some of the cell lines used, including K562, Daudi, and HeLa, was not confirmed by other groups (14, 19, 20). In our study, using >99% αGalCer-reactive human NKT cells, we also were unable to confirm the NKT cell cytotoxicity against HeLa, as well as against any other of six tested CD1d− tumor cell lines. In agreement with our results, it has been reported that human NKT cells can directly kill U937 cells (14, 15). However, this myelomonocytic cell line, as well as peripheral blood monocytes, were reported as CD1d negative (14). Combining this with the fact that NKT cells were not cytotoxic against classical NK target K562, these authors concluded that NKT cell cytotoxicity against tumors depends on mechanisms distinct from those used by classical T and NK cells (14, 15). However, several groups demonstrated that human monocytes express CD1d (48, 49). Moreover, despite their remarkably low surface CD1d expression, all monocyte lineage cells exhibit extremely potent Ag-presenting function for NKT cell clones (50). The U937 cells used in this study (as well as monocytes, which are the APC in this work) express CD1d on the cell surface, although at low density (Fig. 3⇑A), and CD1d gene expression was confirmed by RT-PCR analysis (data not shown). Thus, our data with U937 cells support the requirement of hCD1d ligand recognition for the direct antitumor cytotoxicity of human NKT cells, and argue against a CD1d-independent, non-T, non-NK-like cytotoxic mechanism. Murine NKT cells mediate NK-like cytotoxicity after short-term culture with high concentrations of IL-2, and the killing depends upon NK1.1 and CD16 (51). However, human NKT cells do not express CD16, and the human homologue of murine NK1.1, NKR-P1A (CD161), does not trigger cytotoxicity by NK (52) or NKT cells, because it lacks the cytoplasmic motif CXCP/S/T that associates with p56Lck to signal cytotoxicity (2, 53). CD1d-dependent activation of NKT cells has been reported to be required for the antitumor activity of αGalCer in mice (18, 54). However, NKT cells derived from the spleen of mice treated with αGalCer directly killed melanoma B16 and T cell lymphoma RMA-S cells (18) in a CD1d-independent manner, and this cytotoxicity was not significantly inhibited by an anti-NK1.1-blocking mAb. Thus, murine NKT cells activated by αGalCer may have a TCR- and NK1.1-independent mechanism of target recognition. Importantly, however, data presented in this study with αGalCer-reactive human NKT cells argue against NKT cell cytotoxicity being triggered by cell surface molecules other than the TCR. This suggests that, despite conservation of the CD1d-NKT system during mammalian evolution (16), direct antitumor cytotoxicity of mouse and human αGalCer-reactive NKT cells is based on distinct mechanisms. This is important to be considered in the development of immunotherapy using NKT cells. The ability of NKT cells to kill tumor cells in a CD1d/ligand-dependent manner suggests that malignancies expressing CD1d could be attacked by NKT cells. The distribution of CD1d expression in human malignancies is not known. In normal tissues, CD1d is expressed by monocyte lineage cells (50), a subset of B lymphocytes, intestinal epithelial cells (55), cortical thymocytes, thymic epithelial cells, skin keratinocytes (56), and activated T lymphocytes (28). Some malignancies that originate from these tissues, and which preserve or up-regulate CD1d expression, could be targets for direct NKT cell cytotoxicity, provided they express a natural ligand or bind added αGalCer. This could be exploited for treatment, although possible toxicity of NKT cells against normal cells expressing CD1d and binding αGalCer would need to be evaluated. We have demonstrated that, upon αGalCer recognition, human NKT cells induce NK cells to mediate cytotoxicity against CD1d− tumor targets in the absence of any other cell type or exogenously added cytokine, and that IL-2 is required and sufficient for the induction of NK cell cytotoxicity. IFN-γ depletion partly reduced NK cell activation. As expected, IFN-γ alone did not have an effect and, in agreement with earlier reports for both human and mouse NK cell cytotoxicity (57), only enhanced NK cytotoxicity induced by IL-2 (58). IL-2 is well known to directly activate NK cell proliferation and cytotoxicity (59, 60), and, combined with IL-2, IFN-γ may augment NK cell activation (61, 62). Moreover, IFN-γ produced by NKT cells in vivo may indirectly stimulate NK cell-mediated functions by promoting NK cell mobilization from blood (57) and by inducing NK cells themselves to produce IFN-γ (23). Several lines of evidence suggested that soluble factors produced by NKT cells activate NK cells to mediate the antitumor effects of αGalCer in vivo (12, 22, 23). Treatment of mice with αGalCer induced significant serum levels of IL-2, IL-4, IL-12, and IFN-γ in a dose-dependent manner, and this correlated with augmented NK activity of hepatic mononuclear cells and marked growth inhibition of EL-4 lymphoma cells in liver (63). Using CD1d- and Jα281 (NKT)-deficient mice, CD1d-dependent NKT cells were shown to be necessary for NK cell activation by αGalCer (22). No reduction in NK cell proliferation and cytotoxicity was observed in IL-12-deficient mice treated with αGalCer (22), even though NKT cells stimulated with αGalCer can induce IL-12 production by dendritic cells (64), and IL-12 is known to induce NK cell-dependent antitumor effects in mice with or without NKT cell contribution (65, 66). Instead, induction of NK cell cytotoxicity by αGalCer was decreased in IFN-γ-deficient animals (22). Neutralization of IL-2 did not have an effect on NK cell activation in that mouse model. However, the efficiency of IL-2 neutralization was not determined and may not have been sufficient. Alternatively, as noted above, mouse NKT cells may work differently from their human counterparts. Multiple factors may influence NK cell activation induced by αGalCer in vivo. Our data suggest that, upon αGalCer recognition, NKT cells alone may strongly activate NK cell cytotoxicity in tissues such as liver, which contains relatively high numbers of both cell types (19, 21). This is in agreement with a recent report that αGalCer in vitro induces cytotoxicity of human hepatic lymphocytes that is mediated by NK cells, but that is CD1d and NKT cell dependent (19). In this latter study, IL-12 did not play a role in αGalCer-induced NK cell cytotoxicity, and other cytokines were not evaluated. In summary, the present study demonstrates that, like for classical T cells, ligand-induced TCR activation is prerequisite for the effector functions of human αGalCer-reactive NKT cells. Our results suggest that characterization of human malignancies for CD1d expression and creation of an effective protocol for in vivo expansion of NKT cells may provide a basis for developing immunotherapy based upon direct NKT cell cytotoxicity and/or NKT cell-mediated activation of NK cells. Such therapy would have the advantage of a defined ligand presented by the monomorphic molecule CD1d. αGalCer (KRN 7000) was kindly provided by Kirin Brewery (Tokyo, Japan). We thank Dr. S. Porcelli (Albert Einstein College of Medicine, Bronx, NY) for the generous gift of anti-CD1d mAb 42.1. ↵1 This study was supported in part by National Institutes of Health Grants CA81403, CA22794 (to R.C.S. ), AI45053 (to M.K. ), CA45284 (to B.P. ), and T32 CA09683 (to M.J.L. ); and by the Neil Bogart Memorial Fund of the T. J. Martell Foundation for Leukemia, Cancer, and AIDS Research. ↵3 Abbreviations used in this paper: αGalCer, α-galactosylceramide; β2m, β2-microglobulin; CBA, cytometric bead array; DIMSCAN, digital image microscopy scanning; hCD1d, human CD1d; TC, TriColor; NKT-S, NKT cell supernatant.